Francis Régis Clet was born in Grenoble, on the western edge of the Savoy Alps; he was the tenth child in a family of fifteen. His father was a prosperous businessman with a shop in a good part of the town, over which the family lived. The house is still extant. After his secondary education he entered the local seminary to study for the priesthood, but at the age of twenty-one he entered the Congregation of the Mission in Lyons, where he completed his studies and was ordained in 1772. He was then appointed to the seminary in Annecy to teach moral theology. Annecy is about ninety kilometers to the north of Grenoble, and the seminary building, still extant, was beautifully situated on the shore of a lake.In 1788 he was elected a delegate of the Province of Lyons for the sixteenth General Assembly of the Vincentians in Paris; he was the youngest delegate present. He made an impression on the newly-elected Superior General, who asked him to remain on in Paris as director of the intern seminaire. The situation of his new home was a drastic change from the house on the edge of the Lac d'Annecy. Eleven months after the end of the Assembly the Vincentian mother house, Saint-Lazare, was attacked by a mob on 13 July 1789, the day before the attack on the Bastille. During the next few years the central administration of the Congregation was severely disrupted, but in 1791 the Superior General decided to send three confreres to China. One of those selected was unable to be ready in time for the departure of the ship, so Francis volunteered to take his place; he was forty-three years old. At last my wishes have been granted and I am at the peak of happiness. Providence wants me to go to work for the salvation of the heathens. The opportunity has just cropped up and I eagerly grabbed it; I've just had a chat with the Superior General about it and he is quite willing to go along with my wishes. He then goes on to refer to the various practical matters which need to be dealt with. He says he has previously made his will, but some arrangements need to be made in case he would outlive her. He is not going to hand over to her complete control of his assets. If he did that, and then were to return from China and find that she had already died, he would have no claim. Obviously he was a practical man. He had to pay for his journey to China with money borrowed from the community bursar, on condition that Marie-Thérèse refund the money to the community from Francis' property. I could, of course, be making a mistake, but at least I'm in good faith. If God doesn't bless my attempt I'll cut my losses, admit I was wrong, and in future be more on my guard against the illusions of my imagination or vanity; the experience will teach me a bit of sense. Here again he shows that he was a practical man, in spiritual as well as in financial matters. The former professor of moral theology is revealed in his reference to being in good faith. Father Clet, who had been teaching theology with success for fourteen years, arrived here for the General Assembly. They got to know him well enough to appreciate his worth, and made him director of the internal seminary, and I think that, in spite of his affection for you, the General would not let him go if there were any future for the Congregation here. He has got everything you could ask for, holiness, learning, health and charm. To sum up briefly, he is very gifted. One thing which Daudet did not mention, but which emerges in many letters, is that Francis had a fine sense of gentle humour. Our ears are never assaulted with blasphemies nor the word "liberty". Proportionately, there are more Christians here than in France. He says that his health is keeping up. He has been sick several times, but only once seriously. He has lost a lot of weight. By choice he always travels on foot, refusing offers of a horse. I see no gleam of hope for martyrdom; anyway, I've no problem in convincing myself that I don't deserve it. All the same, our life is not without danger, as over the past six years large numbers of Chinese have rebelled against the government. There are no further letters to any member of his family. From 10 June 1804 until 28 December 1815 there are thirty-eight surviving letters to a Chinese confrere Paul Song, with only six to other confreres in the years 1810-1813. Paul Song had been ordained in 1803 at the age of twenty-nine, and appointed to work with Francis. For the first eight years there was much tension and misunderstanding between them. Sometimes Francis had to write in Latin, as Paul did not always fully understand the letters in French; Francis, of course, could not write in Chinese. In 1811 there came a change, and Paul began to have enormous admiration for his superior. Even during the period of problems between them he had kept all the letters from Francis. The thirty-eight letters to Paul Song let us know quite a lot about missionary life in China in the early 19th century, as well as a lot about these two confreres. Paul Song seems to have been a rather scrupulous and over-sensitive man. Francis, the former professor of moral theology, has to explain to him how to avoid scrupulosity about the obligation of praying the Divine Office. Also, as an elderly experienced confrere, with a quiet sense of humour, he tries to point out that Paul, without reason, interprets some things as referring to himself. Therefore I order you to say your breviary and other prayers in a common-sense way, never going back over them, provided you prepared yourself for these actions by a moment of recollection in the presence of God. How could you have thought that I would be so stupid as to give you a letter to read which contained complaints against yourself? Father Ghislain complains very strongly in a letter he wrote to me that I give my confreres more work than they can handle, so much in fact that even the strongest constitutions are ruined, and that I never allow them to have a break. I'm no annoyed that people complain to major superiors about me; I only wish they would make such strong complaints that my superiors would be forced to relieve me of a weight or load which I cannot carry. Francis made many requests to be relieved of the office of superior, but without success. 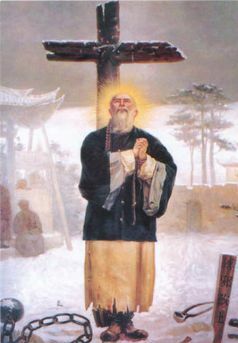 On 1 January 1820 he was found guilty of deceiving and corrupting Chinese people by preaching Christianity to them, and was sentenced to be strangled on a gibbet. The sentence had to be confirmed by the emperor. Yesterday, the feast of the Conversion of St Paul, a day to be remembered for the foundation of our Congregation, Father Chen and I received Communion from Father Tcheng, and we had a feastday dinner at midday with three priests and six laymen, two of whom were prisoners and four were visitors. The only one missing was Father Lamiot, who paid for the meal. These things were possible because he was the prison he was in was for detention, and for punishment. 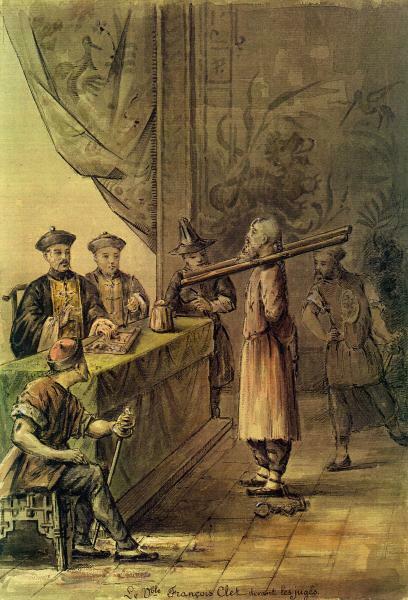 This circumstance also allowed him to adjudicate, at the request of Louis Lamiot , in a dispute between the Portuguese and French confreres in Peking. Francis exchanged letters with both sides, and came to the conclusion that Lamiot was at fault, being too French and trying to rush matters. On the morning of 18 February 1820 Francis was executed, six months before his seventy-second birthday.